I went to the doctor because I kept gaining weight. No matter what I did, I couldn't lose it. Since I had always been tall and thin, the extra weight was disturbing me. I self-diagnosed thyroid issues. I am not a doctor goer. When I went to the doctor on that fateful October day, it was the first time I had been in 10 or more years. I chose the doctor based on her name – I knew someone else who had the same name – and the fact that she took my insurance. This was the luckiest choice I could have ever made. The doctor felt a very, very small knot on my collarbone. She sent me for a CT scan. That day. She called in a few days to tell me that my thyroid was fine, but I had some strange cell activity in my lungs. I needed a PET scan, she said. I had never heard of a PET scan. When we got off of the phone, I immediately began to research. And, what I found was scary. PET scans are used to determine malignant activity. Cancer????? Me????? But, I was as healthy as I had ever been. Sure enough, I was diagnosed with cancer. Specifically, I was told I had Stage IV adenocarcinoma of the lungs that was both inoperable and could not be radiated. Chemotherapy was my only option. 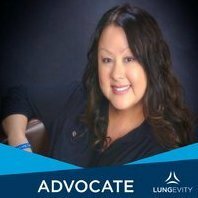 I had watched my father die of lung cancer back when I was in my early 20s. His cancer was also discovered by accident, during a routine physical required by his place of employment. Six months later, at barely 49, my dad died. He went through hell during those six months after diagnosis, suffering through chemo and radiation. I had always said chemotherapy was something I would never, ever do. Until it was my only choice. I began chemo – a cocktail of Avastin, Alimta, and carboplatin – in early December 2012. I was one of those people who had a difficult time. No matter what nausea medicine we tried, I was incredibly sick the first week after an infusion. Fortunately, my health improved by leaps and bounds during weeks two and three. I was feeling pretty good when it was time for yet another infusion. I underwent four infusions of the three drugs. My tumors responded. They didn't go away, but they shrank. After four treatments, my oncologist decided to change the treatment. For four more treatments, every three weeks, I received Avastin. I am one of the unusual ones. Avastin made me as sick as the three-chemo infusions had. However, my tumors had responded. They shrank. They didn't spread. My oncologist was happy. He decided to give my body a break and stop all treatments for awhile. He expected my tumors to remain stable. But, a CT scan revealed that it wasn't to be. The tumors had grown back to nearly the size they had been prior to beginning treatments. The oncologist told me that I basically had two choices. I could begin another line of chemo, with a drug that wasn't as effective and that had worse side effects than those I had already had. Or, I could participate in a clinical trial. It was not a difficult decision for me at all. I chose to go into a clinical trial. I really didn't have great expectations for extending my own life, but I wanted to help others coming up behind me. So, I went to the UT Southwestern Medical Center, one of 69 NCI-designated cancer centers, in July 2013. Nearly immediately, I was fortunate enough to get into a Phase III clinical trial. In this Phase, the drug or treatment is given to many people to confirm its effectiveness, monitor side effects, compare it to other treatments, and collect information that will allow the drug or treatment to be used safely. In my trial, the efficacy of the experimental treatment, immunotherapy, was compared to a known and common chemotherapy, Docetaxel. I was happy that I drew the straw that allowed me to receive the experimental drug. Entering the clinical trial was the best thing that could have ever happened. immediately. Since I began the trial, my tumors have been completely stable. I have very, very few side effects. The worst happened early on – my thyroid quit working properly, so I now take a little pill once a day. I go every two weeks for blood tests, doctor visit, and treatment. The treatment itself takes an hour to drip. Until recently, I was required to have CT scans every 6 weeks. However, the drug company amended the trial plan and I now have scans every 12 weeks. The clinical trial and the immunotherapy gave my life back to me. I am able to live fully and completely – at a time when no one expected me to still be alive, much less living well! And you are a survivor who is the very definition of hope!